April 4, 2019  A preliminary report into the deadly Ethiopian Airlines crash suggests the plane's pilots followed all suggested procedures. The report opens a new round of questions into the 737 Max aircraft. 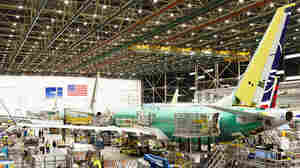 April 2, 2019  Last week, Boeing said software fixes for its troubled 737 Max airplanes were finished and ready to go. But now the company says more time is needed to make sure the fixes are done right. March 28, 2019  The company is still producing about 50 737 Max planes per month. This week, it unveiled software fixes and other improvements for the fleet as it tried to reassure the public that they are safe. March 28, 2019  Boeing invited members of the media, airlines, regulators and pilots to Washington state in a bid to assure them that the 737 Max is safe to fly. The aircraft were grounded after two deadly crashes. March 27, 2019  Boeing is giving updates on the software fix to it's troubled 737 Max jets in a bid to get the plane back in the air. 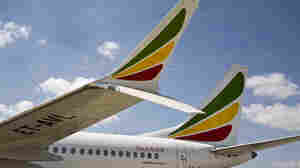 March 26, 2019  Authorities in Ethiopia are preparing to release preliminary findings on the cause of the crash of an Ethiopian Airlines Boeing 737 Max 8 jet that killed all 157 people on board. March 22, 2019  Old reports of safety concerns regarding Boeing's scrutinized 737 Max jets are resurfacing and training procedures are getting fresh scrutiny. March 20, 2019  President Trump is nominating Stephen Dickson, a former Delta Airlines exec, to lead the Federal Aviation Administration while it is being sharply criticized for its oversight of plane manufacturers. March 18, 2019  The news comes amid reports Boeing's safety analysis of a new flight control system on the 737 Max was flawed; and that Boeing is now under federal investigation. March 14, 2019  Some U.S. airlines are scrambling to rebook passengers after the FAA announced it was grounding the Boeing 737 Max fleet. Airlines affected include Southwest, American and United. March 14, 2019  The FAA has grounded all Boeing 737 Max aircraft in the U.S. as investigators probe the cause of the crash in Ethiopia. Also, new information suggests the special counsel's investigation is done. March 11, 2019  The jet crashed shortly after takeoff Sunday killing all 157 people on board. It's the second deadly crash of a Boeing 737 Max 8 jet in five months — raising questions about the plane's safety. February 27, 2019  The dynasty of Daley politicians in Chicago appears to be ending — the city's two top mayoral candidates are African-American women. The women will compete in a runoff election next month. February 26, 2019  Voters in Chicago go to the polls Tuesday to select a mayor, and they've got a lot of choices. More than a dozen candidates are running to succeed Rahm Emanuel, who is stepping down after two terms. February 20, 2019  An "operational emergency" is grounding more than 40 planes at Southwest Airlines because of mechanical problems and creating havoc with travelers.